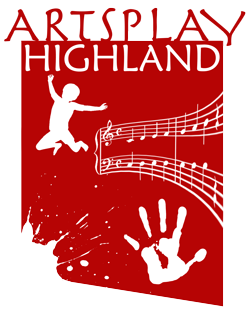 Artsplay Highland has delivered training and educational workshops and interactive projects in the Inverness & Nairn area and beyond since June 2003. Originally constituted by the group of artists from the HI-Arts Artsplay project, Artsplay Highland has focussed its work on the childcare and early years sectors. We deliver training days to carers and teachers and then we go into the groups they work with and we work directly with children. The groups put on performances and exhibitions once our projects have finished. We have run all kinds of projects across all the artforms, working in collaboration with artists.